Star Sports campaign for Australia’s forthcoming tour of India has been bang on target. The ‘babysitter’ jibe has rattled the Australians with the first reaction coming from former Australian opener Matthew Hayden. Taking a lead from Tim Paine’s banter from behind the stumps, the Star Sports has created a TVC that presents the Australians coming on the Indian tour as toddlers. It is an obvious reference to India’s dominance on their recent tour of Australia where the hosts were reduced to novices. The jibe did not go down well with Hayden who has taken to twitter to retaliate. Hayden has responded on a Virender Sehwag, which also carried the Star Sports TVC. “#BeWarned Never take Aussie’s for a joke Viru Boy @virendersehwag @StarSportsIndia Just remember who’s baby sitting the #WorldCup trophy,” read Hayden’s tweet. Hayden’s tweet has an obvious reference to Australia being the reigning World Cup champions. 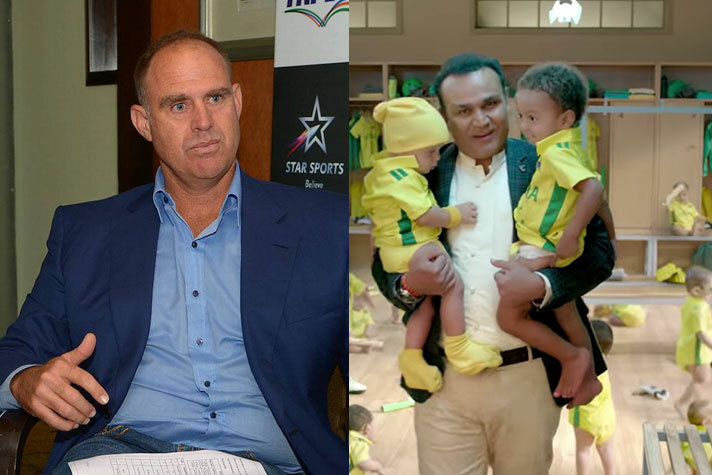 The Star Sports campaign video has featured Sehwag playing with toddlers dressed in the Australia jersey yellow replicas and diapers. Sehwag’s comment that the Indians will be ready to do some baby-sitting further adds insult to the injury. Australia’s tour of India begins on February 24 with the first T20I at the M. Chinnaswamy Stadium in Bengaluru. The second T20 game will be held on February 27 in Visakhapatnam. The five-match ODI series begins on March 2.